28 | August | 2013 | Andrea Works . . . Despite being an obvious attempt to use up leftover soups and minimize waste, it was a favorite dish in high-falutin’ restaurants in New York in the 1920s. Apparently it trickled down to become prison fare. Notice the variety of foods, however. Three squares a day, with coffee twice a day, desserts that actually sound good (spiced crab apples! ), and “fresh milk”, which may very well be RAW milk. 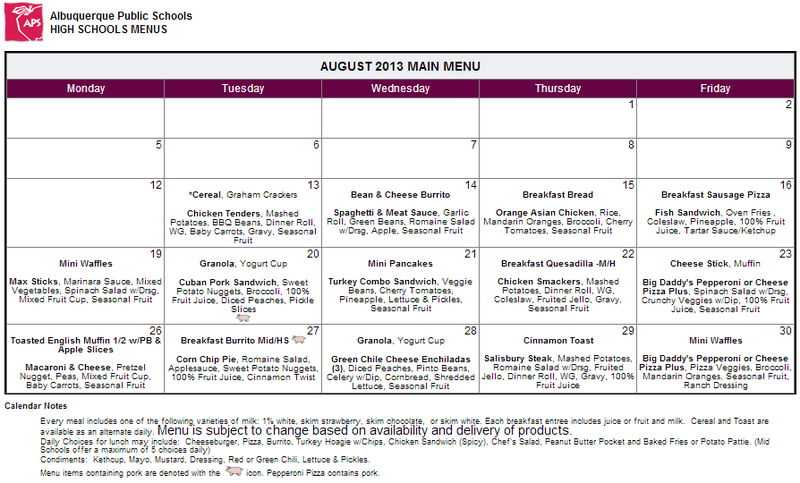 So we are looking at the Albuquerque Public School District’s high school lunch menu. High schoolers are as close as we get to prison age, hence the comparison. Where the Alcatraz inmates were getting homemade soup, breaded cod, broiled tomatoes and mashed potatoes for lunch (that’s ONE lunch), growing and thinking bodies are getting CHICKEN SMACKERS with potatoes, white bread, jello, gravy, coleslaw and fruit. Yipes. At least there’s fruit. I guess. Now I am absolutely not forgetting that the quality of regular civilian food in 1946 compared to today has slid down the same mass-produced slope. Chicken Smackers are normal food that grown adults purchase and eat themselves at home all the time. That’s not the point of this rant. Grown adults, while battered from all sides with conflicting dietary advice to the point of weariness and ultimately rebellion, still pick and pay for their own food. Kids in school and prisoners do not. And in school, it gets worse for the kids that need good food the most. The kids whose family situation makes it hard for them to get breakfast before going to school? They get extra-shafted, coming up in my next post . . .